Hi there all! Kirstin here! My current project is going slowly, so I have no new pics to show you. Instead, I thought I’d address the common questions about alpacas we hear all the time. Do you have to kill alpacas to get their fur? Absolutely NOT! That is actually why we have alpacas. We live in an agricultural area, and love animals, and alpacas were a way for us to raise animals we didn’t have to kill. We shear them once a year, like you would most sheep. Can you eat alpacas? Yes, the meat of all mammals can be eaten, if properly prepared. But alpacas are prized for their fiber (wool), and are not generally considered a meat animal. Their fiber is a renewable resource that grows yearly. Do alpacas spit? Yes, spitting is the least endearing feature of alpacas. Spit is regurgitated, chewed grass. It has a distinctive (like chewed tobacco) and somewhat offensive, odor. Alpacas generally don’t spit at people, but it’s possible to be caught in the crossfire during a cat fight. Are alpacas related to llamas? Yes, alpacas are closely related to llamas. Llamas are twice the size of alpacas, and are used as pack animals. 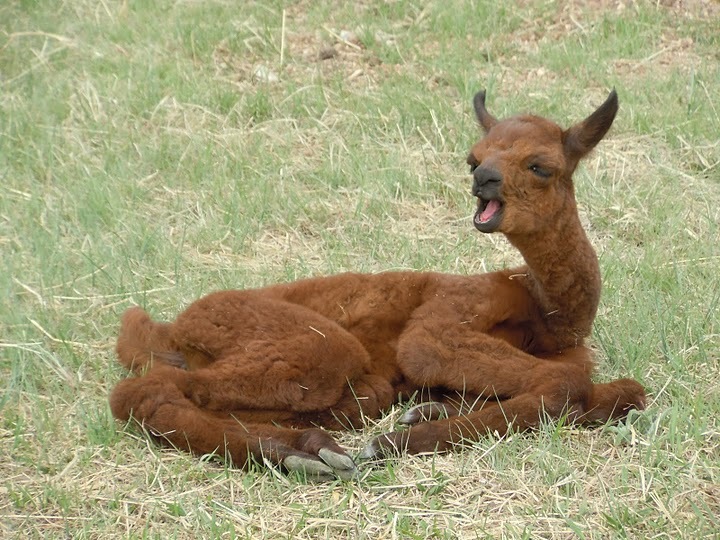 Alpacas are exclusively bred as fleece animals in the United States. How big are alpacas? They are approximately 4 to 5 feet tall and weigh between 150 and 175 pounds. The legs, the yawn, the ears! It’s too cute, my brain ‘asplode. This entry was posted in animals and tagged alpacas. Bookmark the permalink.